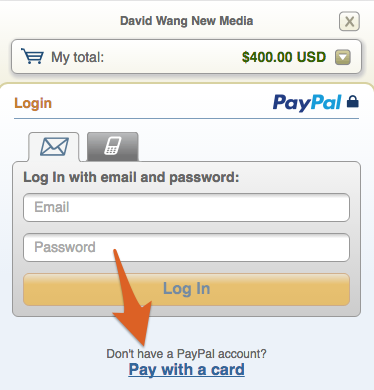 ClickWP (David Wang New Media) processes payments with PayPal. You can pay your invoices with a credit card, even if you don't have a PayPal account. From the invoice page, click the Proceed to payment link. You will then be redirected to PayPal. Next, click the link or button to pay with your credit card. Here are examples of where to find these links/buttons.